As Hammersley and Atkinson have remarked, the interviewer is “intellectually poised between familiarity and strangeness” (Gray, 2003: 85) and I have found this to be the case throughout the data gathering process and throughout the MA. Indeed Buckingham has described “making the familiar strange” (Buckingham 2003:71) as one of the primary tasks of media education from the point of view of “Critical Framing” (ibid: 145, drawing on Cope and Kalantzis). Over the past couple of years I have assumed various guises as: student, writer, researcher, interviewer, observer, film-maker, photographer, videographer, teacher, translator, mentor, blogger and consultant; and all the while it has felt like an elaborate identity- balancing act located somewhere in the pivotal space between the familiar and the strange, the subjective and the objective. I can conclude that the process of isolating aspects of ‘the normal’ to produce research material for creative interpretation gives one’s sense of intuition – or one’s willingness to follow it – a full work out. I like to think that openness, blended with a certain breadth of contextual knowledge limits the potential for the findings to be skewed or for common-sense assumptions to gain traction. The two rudders of ethics and neutrality have informed my data collection strategy. I went to some lengths to comply with BERA ethical standards. Given that the majority of my participants were children, it was important to establish ethical boundaries and informed consent in an effort to reassure them as much as to preserve the integrity of the findings. This was addressed by implementing signed letters of parental consent (see Appendix 2) and by informing participants that their input would be completely confidential and anonymous. The data would be stored securely and only entered into the public domain on their consent. It was also made clear that their contributions would be received with non-judgemental impartiality. That said, remaining neutral in my different roles presented a real challenge, particularly whilst interviewing. There was a fine line between encouraging a natural revelatory conversation and as Connell has suggested – making sure you harvest your exploratory crop to produce the necessary “high theoretical yield” (Gray, 2003: 160). I often found myself fending off thoughts that the whole endeavour was merely the pursuit of the obvious. In these moments it is comforting, not to say vital, to bear in mind Hall’s and Simons’s insights above and an observation made by C. Wright Mills in 1959, that the ethnographic research process is a scholarly craft (Gray, 2003: 5), the accumulative impact of which could have dramatic consequences in the wider world. It can only be concluded that there needs to be an abundance of it, preferably disseminated in the public realm. My research design draws on aspects of the Social Research Methods MA assignment and uses a similar rationale. The ontological position I have adopted throughout this study is influenced by interpretivism and constructionism; that is, I look at my participants’ world-view emically and interpret social phenomena as the outcome of human interactions. In terms of assessing the trustworthiness of qualitative analysis on these outcomes, I refer to Bryman (2008: 377) who, drawing on Guba and Lincoln, proposes that credibility, transferability, dependability and confirmability are the evaluating criteria, in contrast with the quantitatively associated criteria of reliability and validity. A quantitative research strategy, with its emphasis on breadth, the collecting of numerical data and as Bryman has identified – “measurement, causality, generalization and replication” (2008: 140) – is best suited to deductively proving an existing, perhaps scientific hypothesis, one with a remit to measure broad societal changes across populations. The former four criteria, however, embody a sense of elasticity – which sit well with the non-realist view that absolute truths about the social world are simply unfeasible. 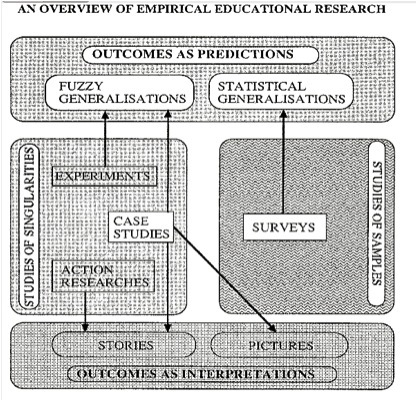 The below chart houses an overview of approaches to educational research outlining the potentially rich outcomes from “studies of singularities”, as opposed to “studies of samples”, where qualified “fuzziness” is positively encouraged. Even Williams, with reference to the difficulties of studying any past period, refers to the “in solution” (Storey, 2009:36) nature of “the living experience of the time” (ibid) possibly implying the fruitlessness of extracting general principles from a range of data in the present, given that the data is always “an inseparable part of a complex whole” (ibid). My case studies have involved mainly face-to-face audio-recorded, some video recorded, semi-structured interviews, phone interviews, focus groups and observations as well as photo elicitation. I will be taking into account the various sites of production and employing triangulation in relation to the research data, the texts, the virtual and physical audiences and the locations in which the texts were received in order to identify patterns between discourses. “one moves from one detotalized or deconstructed problematic to the gains of another, recognizing its limitations … [why?] Because what is at stake really matters.” (Hall: http://cultstud.blogspot.com/2007/09/stuart-hall-cultural-studies-and-its.html). Three of my case studies came out of a serendipitous meeting with Mark Reid, the Head of Education at the British Film Institute, in October 2010. I was looking for case study material and he was keen to have current school partnership projects with strong multimodal components tracked, documented and in one case, evaluated. London Nautical School (LNS) is a state secondary school with over 650 boys located in central London on the south bank of the Thames, near Waterloo. In terms of infrastructure, most of the original early 20th century buildings are still in use, some listed as Grade 2, and the school has a well-thumbed, ‘old-school’ air about it characterized by vertiginous stair wells and peeling paint. The school is a Specialist Sports College and all boys pursue Nautical Studies at Key Stage 3. In 2010 42% of students gained 5 or more GCSE’s including English and Maths. Once a week from November 2010 to May 2011 a small group of mainly higher achieving Year 9 boys attended a film production after school project based at Lambeth City Learning Centre in Clapham. Some had attended the same course the previous year. Another group of similar aged boys from Lambeth Academy (LA) in Clapham attended the same project. Some had film experience from the previous year but neither group had met each other. Lambeth Academy is a new co-educational secondary school with £25 million worth of investment. In 2011 36% (ibid) of students gained 5 or more GCSE’s including English and Maths. Similar to LNS in terms of ethnic diversity, the difference with these particular boys was that they had all attended the Special Educational Needs department of LA at various stages, with issues related to autism and/or behavioural problems. The last two case studies involve state primary schools: Telferscot Primary School (TPS) – a mixed, multi-ethnic state school in south London with a mixture of middle-class and low-income families and St Elizabeth Primary School (SEPS) – a mixed, diverse, catholic state school in Bethnal Green in a socially deprived area of Tower Hamlets, East London, wherein a significant proportion are white, low-income families. The TPS project was a collaborative, multimodal learning experience with Year 4 children, based at the BFI & Southbank Centre, spread over half a term for two days a week; my role here was to observe and report back to the BFI on learning outcomes. As St Elizabeth’s is my part-time place of work, the SEPS case study was my own multimodal poetry/film project with Year 6 children identified as having low academic ability, for one afternoon a week spread over several weeks. The reconfiguration of knowledge, or the re-assessment of what can be known, why, from whom, where and by what means, is no longer the preserve of academic experts. Most members of a democratic networked society, young and old, can now have a voice through the use of social media and other channels and it is the purpose of qualitative social research to examine the resultant highly visible ‘mess’, or otherwise, of public production and consumption. One way of unravelling the mess would be to deploy measured, self-reflexive ethnography, mindful of its sociological and anthropological roots, yet ready to grasp contradiction and anomaly; an approach which is resistant to essentialism and homogenization. That said, findings using this method must still be met with: “epistemological suspicion” (Gray, 2003: 176, drawing on Back); the more conviction with which a researcher makes a truth claim, the more acknowledged their “partially positioned” (Gray, 2003: 183) perspective must be.